is this the will of the gods? The Magi selected the most powerful agents to carry out their plan, black-winged angels of death wielding Diviners: the Grim Angels...born anew for the first time in 1000 years. Like most things in Riviera, not even the concept of the Grim Angels is as straightforward as one might think. Although they go by the same name, the three Grim Angels of this story - Ein, Ledah and Malice - and the ones who took part in Ragnarok one thousand years before these events are two very different things. Unlike the first Grim Angels, Ein, Ledah and Malice were not originated by the sacrifice of the gods - instead, they were residents of Asgard who were directly chosen by the Magi (and especially by Hector) for the mission. In exchange for the power they received, they had to give up a part of themselves as a proof of their submission to the will of the gods. 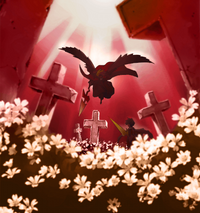 It is said that Ein had to give away his wings as part of his covenant, but, as that would make him the only one of the three Grim Angels to have forsaken something material, there is probably more to it than that. Ein's past is never really touched, but a few hints may lead to believe that what he was really asked to gave up for his Diviner was his previous life in Asgard, therefore making him wingless: he might then be an exhiled angel. Also, if this condition is temporary for his mission, it is easily explained why the Magi would deprive him of something that could be very useful for their purposes: to ensure that Ein completes his mission so he can be called back to Asgard and retrieve what was lost. One might ask why Ein was chosen in the first place since in the beginning he appears to be inexperienced and not as powerful than the others, but it was probably his naiveté to make him a good candidate for becoming a Grim Angel; Hector probably thought he would have followed his will no matter what, and Ledah would have helped him drown any possible doubt. As for Ledah himself, he was asked to give up his emotions because they would have interfered with his mission, nothing less and nothing more. As such, we can imagine that he was a very different person before the events of Riviera. Malice's case is darker yet. If we have to hold the drama as canon, Hector basically destroyed her life without her knowing so to give her a reason to become his pawn. The drama reveals that Malice lost her parents to the appearance of the demons in Heaven's Gate and was then left to her own devices, her noble status devoid of all meaning. At the time of the events, she is still an innocent child; we see her praying the gods that they would save her mother, to no avail. As her prayers were not listened to and she was forced to live in misery, Malice developed a deep grudge towards the gods that allowed this to happen; so, when Hector was looking for someone to help him become an absolute god, Malice jumped on the opportunity to actively take part in forging what she thought would have been an utopia in which no one would have had to suffer like she did, and the divine power would have no longer been scattered through all the weaker Magi, but focused in a single, much more powerful entity. She wished for a world in which prayers would be heard and in which there was a god with the power to actually change things. What do you want from the gods? Power is not good or evil. The strong should rule. Angels will live in bliss under Master Hector. What Malice didn't know then is that the demons of Heaven's Gate, the ones that took the lives of her father and mother, were actually Sprites sided with Ursula, and were trying to defend Heaven's Gate from the ambitions of Hector. Her father understood what was going on, and traded blades with them, as he could not bear to stand for the gods of Asgard. Her mother was accidentally killed by some of the resistance forces. When all of this happened, Hector saw in a Malice developing deep anger and resentment towards the current state of things his perfect pawn, and proposed himself as the better alternative to the gods that, in her view, had allowed all of this to happen. Malice lacked the skill to become a Grim Angel, according to the other Magi; so, Hector faked her selection, made her believe that she possessed power from the beginning, and asked her to trade her future for a Diviner - without her knowing that it was a fake one. As she thought her life was already ruined, she agreed, and felt like she had to use her mission as her last chance to leave a footprint on the world and give her life some meaning. She was told that the Sprites had been the ones who had killed her mother, and was sent to kill them to allow Hector to become a god. From her perspective, Hector revealed her hidden power and gave her a purpose for which to live, thus explaining her deep loyalty towards him and why she was willing to sacrifice her future for him, while she was kept away from the truth about her position as an agent of the gods and what the Grim Angels were really doing for Hector.